Grandfather: Canan, canim (my dear), you should start managing your time wisely. Me: Grandfather, what does managing mean? Grandfather: It means creating a robust but yet flexible habit to succeed in your target aims even at the most extreme conditions, against internal and external resistances. To me, managing is exactly what this is. The best things in life are never achieved easily. They take passion, compassion, vision, diligent and cooperative work, patience, and endurance. In my previous essay,Launching a Lab, I explained the development of my lab, which now consists of a team of graduate and undergraduate researchers; postdoctoral associates; a lab manager; an administrative assistant; our cleanroom, the YellowBox; and the systems and procedures, methodically developed, which help bind all this together. Our first year was filled with new challenges and lessons that have made us stronger both individually and as a research group. Our motivation is to build upon our successes using our group’s culture of safety, efficiency, and passion for impactful research, assuring the longevity of our work and the lab. As a new faculty member at the Media Lab, I had the opportunity to begin a research group from scratch and develop my own research direction—but sometimes it can be extremely difficult to determine where to start. A wealth of resources exists, but accessing them can seem impossible if you do not know who to contact and when to contact them. This was particularly true in my case, as not only was I starting a lab by bringing in students/researchers and developing a research plan, I was also physically building the facility that would forward our research: our cleanroom, the YellowBox. This meant interfacing with a multitude of groups including architects, contractors, facilities management, finance, and the Environment, Health & Safety (EHS) Office, which have helped us to determine the safety and compliance of our lab. In order to manage all of these moving parts, being organized was an absolute necessity, as was determining what resources on campus and within the Media Lab were available to us. It took more than nine months to design and build the YellowBox—a lot of time for a research group. Once the YellowBox was ready, it was important that it be precisely maintained and that research was conducted carefully and efficiently, in order to maximize resources and time during the creation of our novel mechanically adaptive microfabricated devices. 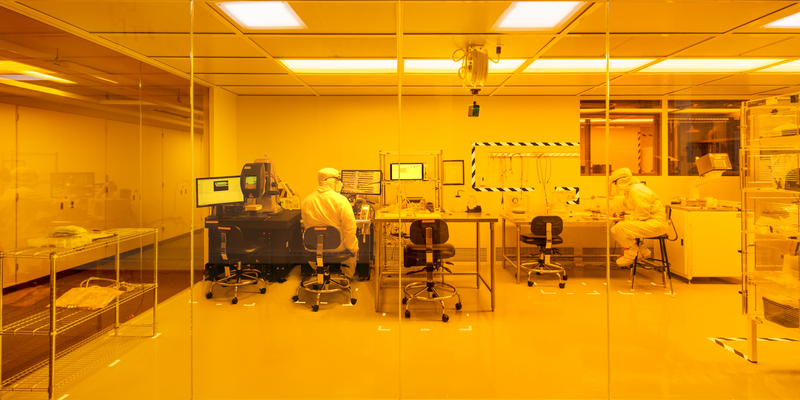 The YellowBox is a state-of-the-art microfabrication and characterization facility, the first-of-its-kind cleanroom built inside the MIT Media Lab. Its purpose is for the exploration of novel device design and fabrication strategies to create microscale systems with mechanically adaptive features that allow intimate integration with the objects of interest. Our research is very complicated, and upkeep of our lab can be quite challenging. Our motivation for becoming more organized stems from our inefficiencies, potential safety risks, and variables. Inefficiencies hurt us in many ways, from time spent on maintenance, to supplies running out—literally during the middle of an experiment!—to lost productivity when researchers can’t find the tools they need. Potential safety risks include lots of highly complex research equipment and chemicals, which pose dangers ranging from “pinch-point” hazards all the way to potentially being fatal. In addition to these concerns, there are many variables in our group to consider—we have over a dozen researchers and personnel; lots of equipment, materials, and supplies; only ~1000 sq.ft. of laboratory space; and a very fast-paced research environment. How do we balance all of this? From this effort, we wanted to find a way to streamline our laboratory space. My hope was that we could become more efficient, increase our productivity and the time we spent on research, save money on supplies and general lab costs, and increase the safety of our environment and researchers—all while balancing our limited resources. Lean manufacturing is a method and management philosophy which evolved from the Toyota Production System (TPS); the term was coined in 1988 by John Krafcik at the MIT Sloan School of Management in his article, “Triumph of the Lean Production System.” Lean manufacturing is a system-wide perspective involving a focus upon the flow of work and determining ways in which to make the flow smoother, eliminating or changing process elements which might slow or impede the system. This method has the added benefit of slowly reducing all aspects of waste —time, materials, man-power—allowing for system optimization. Lean principles have been adopted by companies and industries worldwide because of the huge benefits from this methodology. For instance, Toyota has become a worldwide leader in automotive manufacturing, because they have employed “lean” practices into their work space to become more organized and less wasteful, ultimately leading to increased profits and higher reliability from their vehicles. “Lean” practices can be adopted to any environment—from lab and office spaces to specific research areas such as the work bench or chemical wet bench. Traditionally, “lean” manufacturing has been used in industrial factories. Recently, the “Lean Laboratory” model borrows from these concepts. Our group applied 5S Methodology and SOP (Standard Operating Procedure). 5S Methodology is an organization system which uses five guiding practices to organize a work space for efficiency and effectiveness: Sort, Set in Order, Shine, Standardize, and Sustain. The system originated in the Japanese manufacturing industry and most notably was an essential component of one of the most successful management principles in the world—The Toyota Way. We identified 5S as a system to help us increase our productivity in both the office and research laboratory. A standout feature for us is that the method is primarily visual in nature: 5S uses color-mapping to show function and placement, with the added benefit of reducing the amount of brain-drain associated with a specific task. There is no question of where a piece of equipment should go, or what areas might contain hazardous chemicals, and everything is clearly marked and easy to find. Essentially, 5S is an organizational methodology that uses visual labels—color-coded based on functionality—to organize spaces and increase safety, identifying potential hazards and procedural information. It really makes the working environment more intuitive and easy to follow. No matter what system is being implemented, it will not be maintained if there is not complete compliance. Knowing this, we set in place a weekly Friday check of our 5S system. Everyone in the lab is responsible for ensuring the cleanliness and organization of a portion of our shared area. Through this process our lab is kept neat and orderly, and it requires less time each week to check our process, giving us even more reason to maintain the system. Standard Operating Procedures (SOP) are step-by-step instructions that help personnel carry out simple procedures for complex experiment-based tasks. The aims of the SOP are to clearly communicate task expectations, ensure compliance, serve as a training document for new group members, and ensure uniform quality output of experimental results (i.e., to ensure that all researchers are executing the steps in exactly the same manner, so that research results are easily duplicated across the lab). 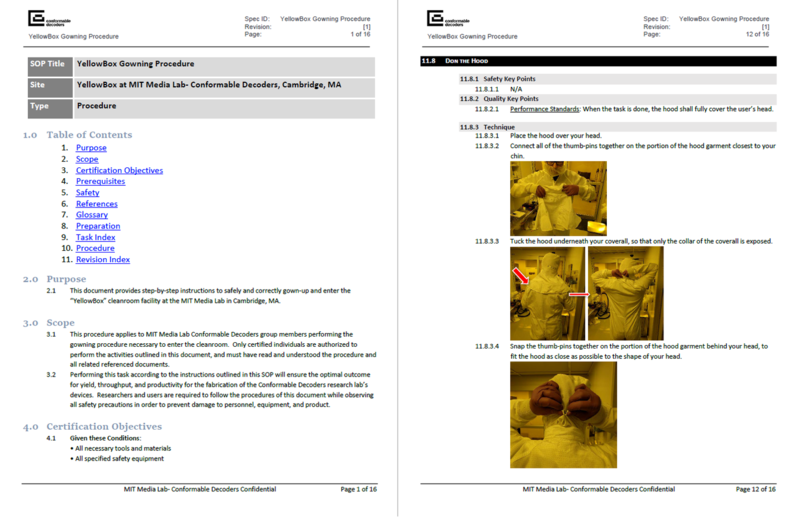 A screenshot of the Conformable Decoders group's Standard Operating Procedures (SOP), a document they use to help personnel carry out simple procedures for complex, experiment-based tasks in their research lab. The success we have had in these techniques has been twofold: these techniques have helped to increase our lab’s efficiency and have also worked as measures of safety and compliance to which all labs must adhere, protecting researchers and research. By color-mapping our space, we have identified both potential hazards inside and outside of the cleanroom and safety documents, and we have clearly marked emergency materials, facilities, and paths of egress. By writing down our processes, we have ensured that individuals not engaged in research understand how a process has been completed, and how equipment is operated and maintained in the event of any issues or emergencies. It is relatively easy to organize the work space or to document standard operating procedures in the lab; what’s not easy is having the discipline to follow through with that same organizational system. Without discipline, even the most organized and well-maintained lab space can become cluttered and disorganized in no time. However, in my research group, we have been able to sustain these efforts, because we fostered a culture that incorporates these lean principles into our daily habits. The Conformable Decoders team members inside the YellowBox cleanroom. Initially, there may be resistance to cultural or organizational changes. As with most great ideas, being persistent is the key to success. Part of the resistance may be that being too organized can impede those creative types—and admittedly, the MIT Media Lab is a place full of misfits; a place where future ideas are born. To adopt such a structured culture into a very dynamic research environment—without restricting creativity—we need to strike a balance. We do this by fostering a sense of community into our culture of being lean. We give out the ownership to group members, so that everyone feels a part of the process and takes ownership and responsibility. For instance, each researcher in our group is a “super-user” for a particular equipment or area, meaning that they are its resident expert and owner. As the experts, they are responsible for every aspect of that space or item, including upkeep. When everyone in the group owns a piece of “property” in our lab, the combined ownership of all these properties as a whole resembles a neighborhood. Students and researchers start to think, “I wouldn’t like it if my next-door neighbor left a mess or misused my property (lab space), therefore I should return the favor.” This is what we call being a good citizen of our research laboratory community! The immediate impact and benefit of the 5S organizational methodology, and more broadly the “Lean Laboratory” concept, is clear. By organizing our lab using lean methodologies, we strengthen our safety culture, increase our efficiency, and save time and money in the long run—all while balancing our limited resources and lab space. Using 5S and SOP in our lab has the added benefit of explicitly communicating safety to researchers about every aspect of our research environment, while ensuring compliance. The SOPs document safety between each and every step of the work. The 5S Methodology provides visual cues for safety by highlighting a path of egress, hazardous zones, fire extinguishers, chemical cabinets, and so on. A big benefit to having structure in a work space is that inventory is easily accounted for. As an example, in our lab we know the exact quantities of supplies on hand, due to our inventory system supported by the 5S Methodology. With this information, we can forecast material consumption rates and become data driven in how we operate our research lab—leading to cost savings in materials. Documenting our SOPs also has a benefit to the hiring of new group members. It becomes easier and more efficient to train new students, uniformly communicating the expectations of the research and all the related safety hazards—without relying on the expertise of former group members. Being highly organized and efficient has had the profound benefit of achieving a Green Labs certification by EHS—the first research lab at the MIT Media Lab to receive this designation since its founding in 1985. 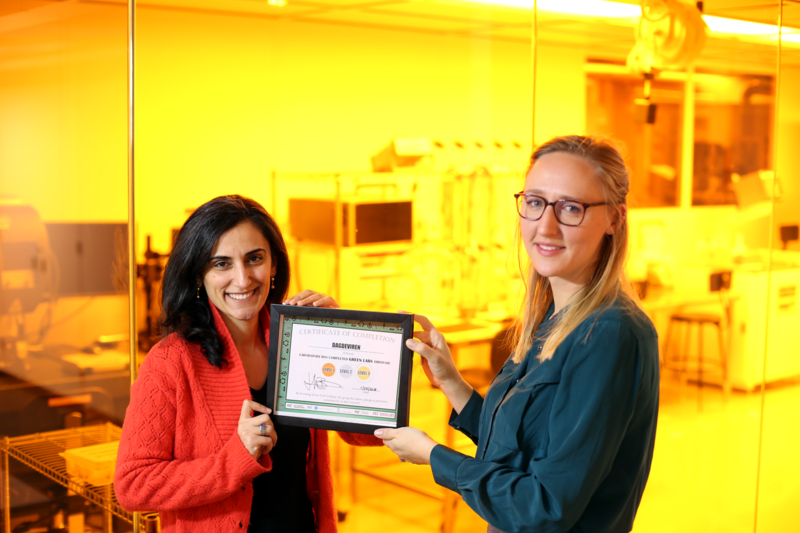 Jennifer Ballew, GreenLabs/LEAC Program Coordinator at MIT, awarding Conformable Decoders group head Canan Dagdeviren a Green Lab Certificate for the group's cleanroom lab space. Having an organized lab space provides a peaceful environment for researchers doing their experiments. We experience less “brain drain”’ and can focus on research. The fewer decisions and calculations that one has to make while performing a task, the more efficient this task becomes. Although searching for missing tools may only take several minutes, the focus of the researcher is decreased. Furthermore, 5S makes lab equipment easier to operate, highlighting critical areas so that researchers don’t have to remember or think too much—the environment becomes intuitive. Our efforts have recently been recognized by EHS; we have started a collaboration with them and receive guidance from the managing director of EHS, Tolga Durak, PhD. Key components of the Conformable Decoders group's lab-management strategy. We are proud of the success we have found in our first year, but we do not want our story to stop there. We believe that our methodology and ideology align closely with the goals set out by MIT EHS, and for this reason we are working together to identify opportunities that could help labs across campus find this success. We believe our collaboration video will be a starting point for junior faculty to begin thinking about how to maintain their lab spaces, so that they can become lean, safe, and efficient, assuring the longevity of their research endeavors. As our lab grows, more updates on our lean lab will follow. Stay tuned! This story was cross-posted to Medium.